Check out this UNA faculty member’s blog for the heartbreaking story of Big Mama, a grandparent caregiver. The university is having a Social Work Day and Dr Stanfield is showing the Academy Award winning documentary about Big Mama’s struggle to raise her orphaned grandson. What a week we had! On March 15th we held GU’s first hill briefing of 2007, which was held in partnership with the Pew Charitable Trusts, The Children and Family Research Center at the University of Illinois at Urbana-Champaign, AARP, CLASP, CWLA, CDF, and NICWA. The briefing highlighted the release of a report regarding positive outcomes for children living in relative foster care. Reports like these are helping to dispel the unfortunate misconceptions about grandfamilies, revealing the advantages and benefits of this important permanency option. I had the pleasure of moderating this special event in our nation’s capital. Accompanied by speakers from the Pew Charitable Trusts, The Center on Children and Family Research, and four special people who shared their personal stories, this briefing was moving and inspiring in equal measure. Special thanks to Brian and Melissa Rote, JJ Hitch, and Harlen Sponaugle who touched the hearts and minds of the audience with their moving, personal stories of trial and triumph. We thank you for standing up and speaking on behalf of the many whose stories go untold. We were delighted by an unexpected visitor! Pictured on the right are Brian and Melissa Rote with Senator Grassley (R-IA), who dropped by to say hello to his fellow Iowans. GU would like to thank Senator Grassley for attending on such short notice, Senators Clinton and Snowe for providing GU with a great briefing room in the Dirksen Senate Office Building, and all of our cosponsors for their partnership on this important issue. You might remember that Senators Clinton and Snowe introduced S. 661 earlier this month. Chelsea Maughan from Sen. Clinton’s office stopped by to talk about this legislation so we thank her too. Let us know if you have any questions about the briefing and click here to access materials! While we were talking about how children fare in relative care (more on this later, I promise), the Urban Institute and First Focus were talking about how children fare in the federal budget. I share their passionate frustration at our nation’s missed opportunities: the children who do not receive a decent education, the children who die because they can’t get good medical care, the children whose lives are all but stolen from them through poverty and exclusion. My concern is that the reports tread a barren path. Talking about the needs of children while pointing to rising expenditure on Social Security and Medicare raises the specter of intergenerational conflict. We must recognize that the generations are interdependent. Each new generation can expect to learn, earn and age, all the while standing on the shoulders of the giants who came before them. Nowhere is this clearer than in family life. One in twelve children lives with a grandparent, and 2.5 million of these children don’t have a parent present in the home. The older generation can also be among the most passionate advocates for children and youth. In Florida, older adults have campaigned for quality pre-K for all children – even when they knew their tax bills could rise to pay for it. At some time in our lives, all of us will need the support of those around us. Children need our support, our societal investment in their health, education and well-being. And we will all benefit from the investments we make in our children. Older adults may find themselves caught in the twin traps of poverty and ill-health. The older generation has served and paid and earned and saved, and we owe them dignity in return. These twin claims do not compete: we are one society, one family. Our allegiance should not lie with just one generation, but with all those who need a little extra help. 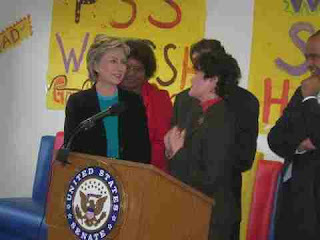 On Monday, I made a dash to New York to join Senator Hillary Clinton in talking about the difficulties faced by grandparents and other relatives raising children, as well as the Kinship Caregiver Support Act (S. 661). I thanked her for all her work, and spoke about the legislation and how important it is for so many people. We were at the GrandParent Family Apartments, which were designed and built for grandparents raising their grandchildren. It’s a really special place – and I was so excited to meet the families who live there and to see old friends. I want to thank Dave Taylor, whose organization (Presbyterian Senior Services) runs the Apartments, for this picture. Dave, his staff, and their partner organization West Side Federation for Senior and Supportive Housing Inc, did a wonderful job hosting the event. I’m afraid the photo only gives you a glimpse of just how lively and colorful the space is, but I can tell you that it’s a wonderful place, with wonderful families living there. Actually, the whole visit was incredibly exciting. It was like hanging out with a rock star! Of course, the Senator is often followed by the press, and she has Secret Service protection as well as her staff. People started to gather outside the center when they saw the cars and cameras and someone started a chant: “Hillary! Hillary! Hillary!” She signed photographs and stopped to talk to the crowd: it really was quite an experience!